Bathrooms, cabinets, kitchens, and much more in this makeover madness edition special. See all the before and afters by clicking over to the features that pique your interest the most! 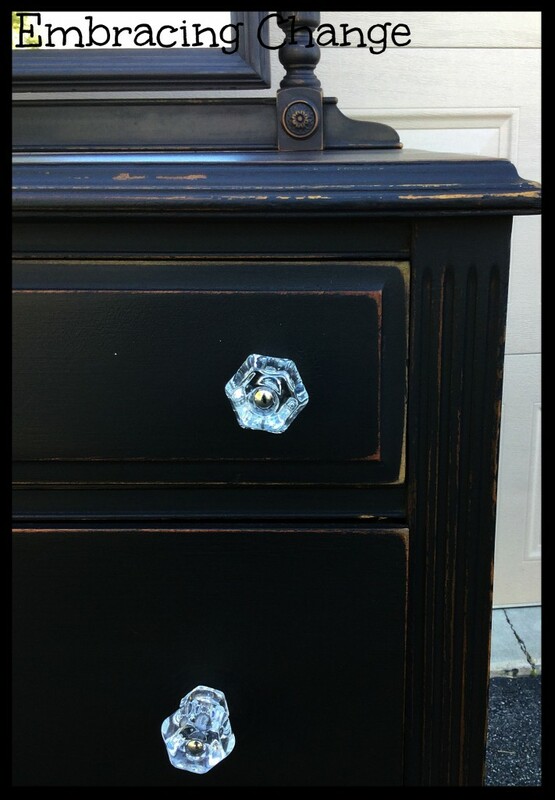 This kitchen cabinet makeover looks fantastic with our antique pewter knobs and pulls. While it originally had some beautiful colors, rustic beauty, and lots of character LZ wanted something with more of a modern feel. The results speak for themselves. Check out how it came together over at The Summery Umbrella. Another kitchen renovation and this one truly is amazing on the before and afters. 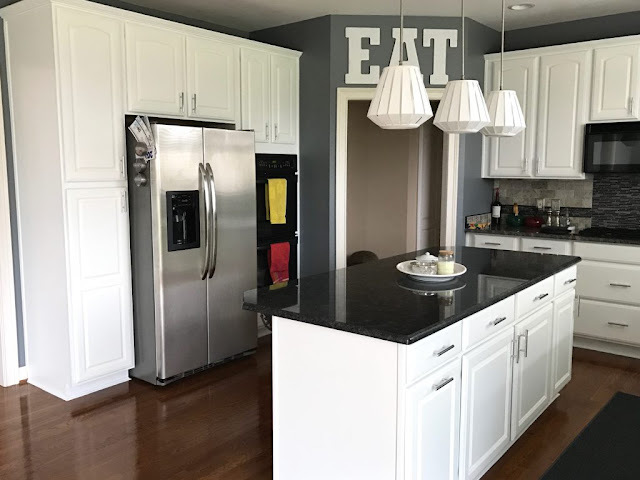 From a bare wood setting to an all white makeover this kitchen is renovated from top to bottom by Evolution of Style. 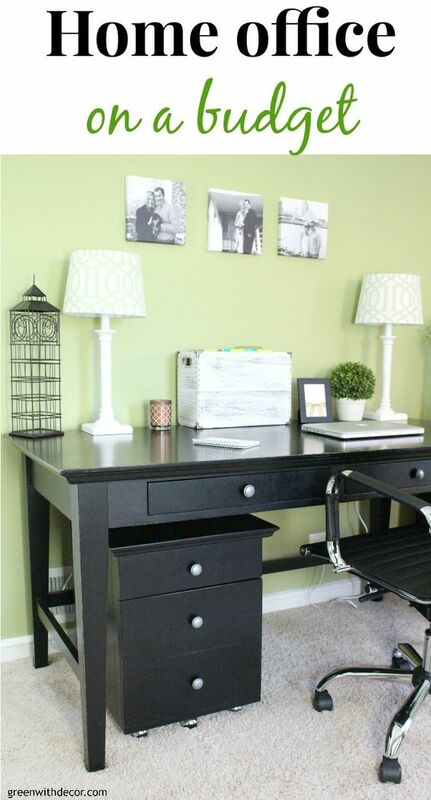 This home office goes from drab to fab in this makeover from Green with Decor. A lot of new decor was used in the makeover and you can find out how it all came together and where to get it for yourself by clicking over. 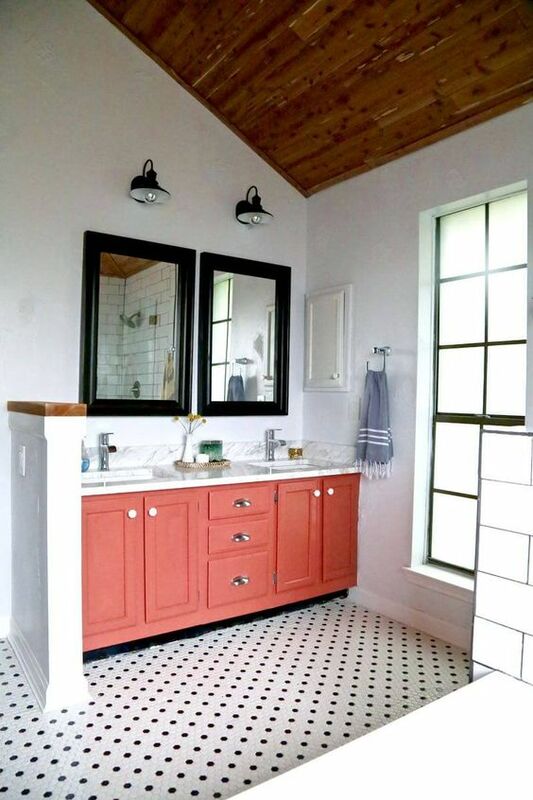 Finally, a bathroom makeover just for you. From bland, brown, and boring to totally fabulous with a spotted floor and reddish pink cabinets this makeover reveal from Love and Renovations is a must see! 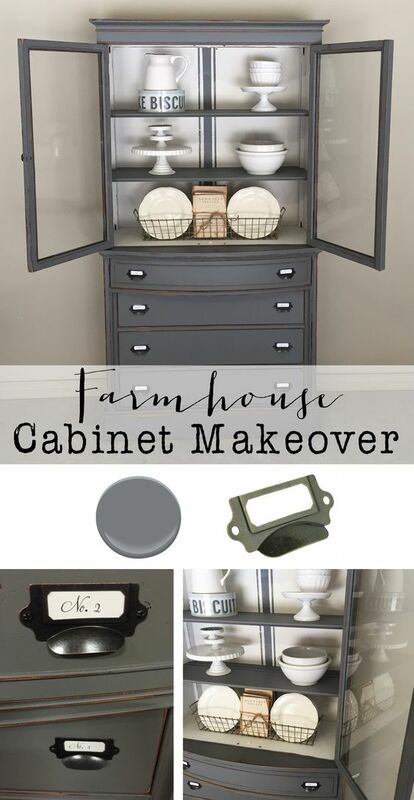 This was originally a traditional looking china cabinet and it got the farmhouse makeover. The cabinet was painted in a beautiful grey color called Steel Wool by Benjamin Moore. Brought to you by House of Hargrove. We have a wonderful line of glass knobs and pulls under our own brand name. People absolutely love them and I'm sure you will too once you see all the different ways they have been put to use by some of our favorite DIY bloggers. First up is this white dresser, painted and distressed for the vintage look and feel that is has. 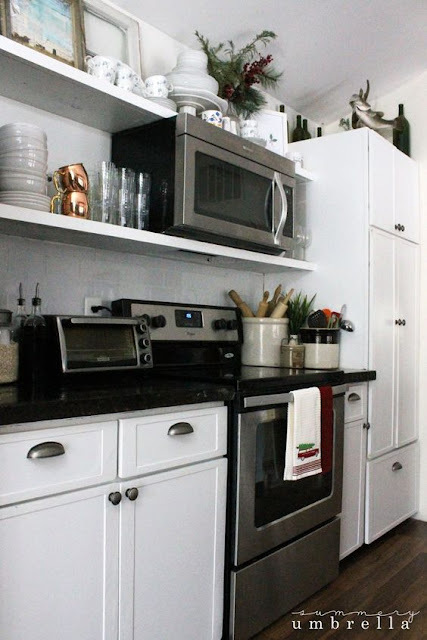 Our milk white glass knobs and pulls help put the finishing touches on a nice dresser makeover from Number Fifty Three. 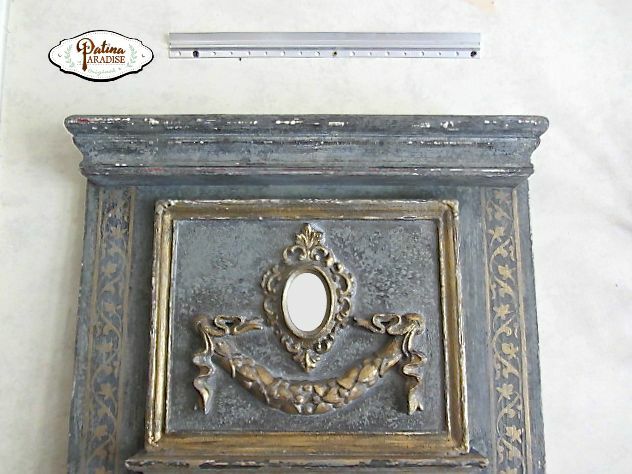 You're really going to want to see how this charming bedside table comes together over at The Painted Drawer. 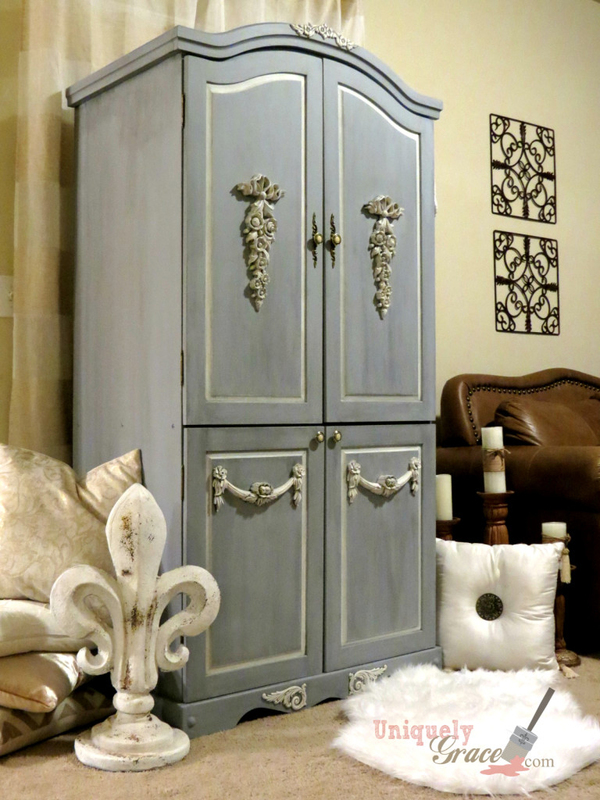 Suzanne used some Annie Sloan chalk paint in Aubusson. And when distressed the deep blue looks fantastic on darker toned woods. Octagon glass knobs courtesy of D. Lawless go great with this piece. 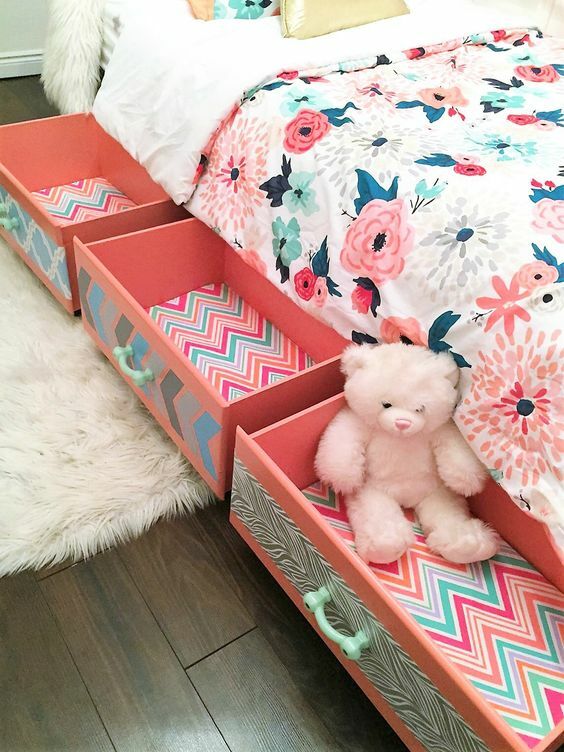 Purdy Little House takes some old drawers and creates some beautiful under the bed storage space for her kids room. 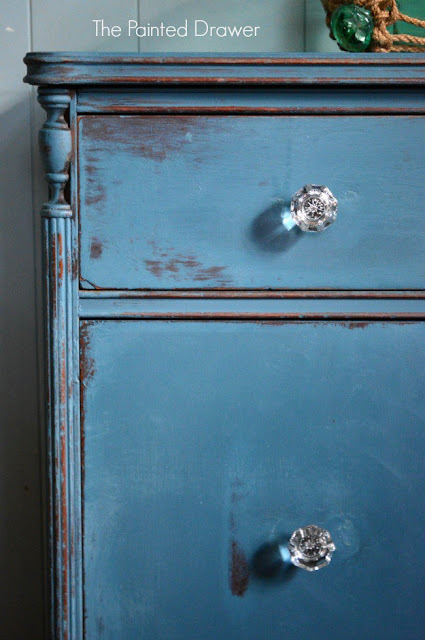 The drawers were painted in a rich coral shade that goes great with our milk green glass pulls. This little antique server table in a red that certainly catches the eye uses our most popular item the 1-1/4" clear glass knob. Stacey from Embracing Change makes it all happen from beat up worn out antique furniture to this brand new look in emperors silk. Stacey from Embracing Change is a D. Lawless All Star so we couldn't help but feature her twice. 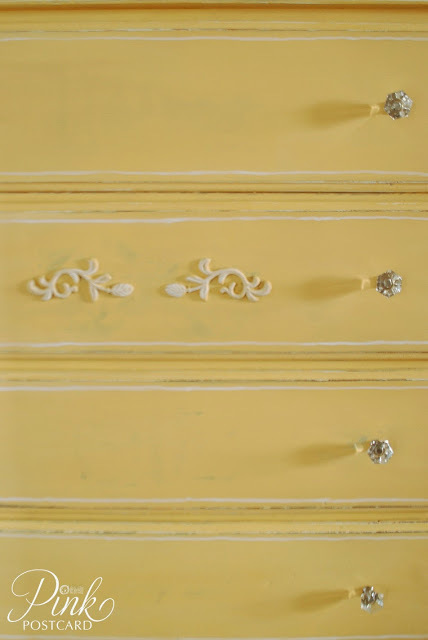 This antique beauty in miss mustard seeds typewriter milk paint is just gorgeous. The ice blue glass knobs provide the perfect contrast. Make sure to click over to see the full piece. This lingerie chest started off with an asain flair and went through an incredible transformation. 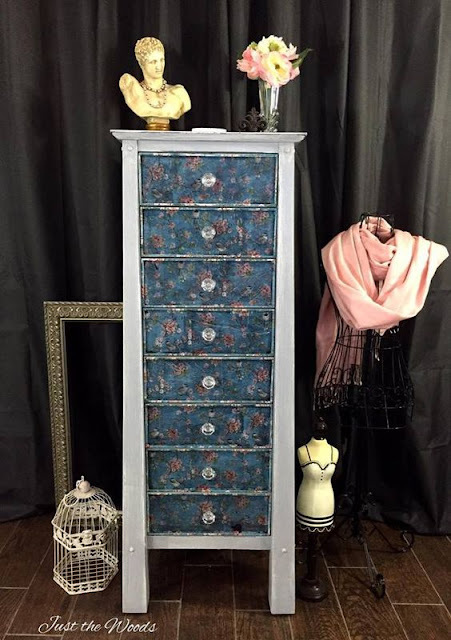 Now it would be more aptly described as a stunning weathered lingerie chest with love birds decoupaged drawers. Just the Woods will give you the full scoop on the makeover. 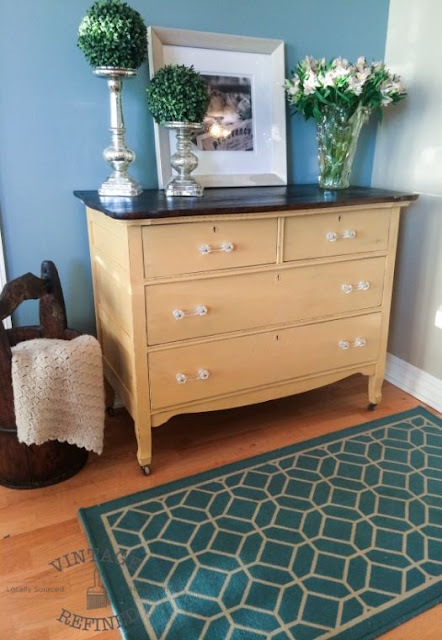 I love this yellow dresser using our clear glass knobs from Vintage Refined. Annie Sloan's Arles gives it the deep yellow color that you see pictured and it's rich enough that it doesn't seem nursery, but soft enough that it doesn't take you back to the 70's. Fabulous makeover! 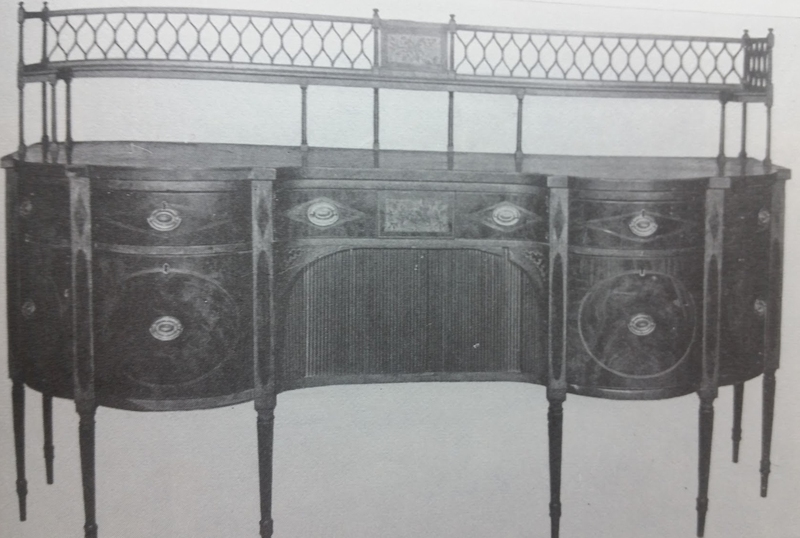 There are many, many differences in the furniture styles of George Hepplewhite and Thomas Sheraton. These two furniture artists of the mid 18th century each had a style to their own but today I'll focus on a quick and easy way to distinguish between the two styles that won't fail you very often. It's the legs! 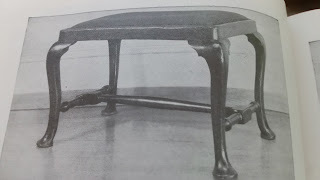 Both furniture makers got their influence from the styles of England (as did everyone back then) and the differences are hard to spot except in the case of the legs. Short and simple. 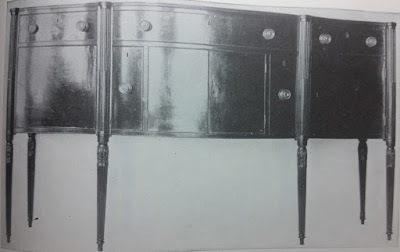 Hepplewhite kept his legs SQUARED and tapered while Sheraton almost always used a turned style (still tapered) on his furniture. Some examples will follow. This rule applies to pretty much any piece you are looking at from chairs to sideboards. 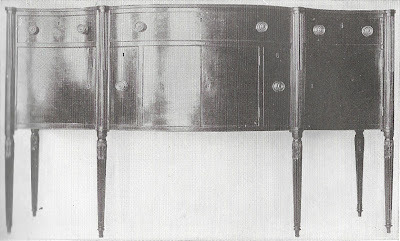 Here are a couple of Hepplewhite sideboards as examples of the squared, tapered legs that are typical of George Hepplewhite. Both of these sideboards are circa 1790. The first one has a bit of Sheraton style in the intricate inlay, but the style of the legs overrides the Sheraton influence and this piece surely qualifies as Hepplewhite. As I mentioned before, there is a lot of subtlety in determining older pieces, so it's good to have a rule of thumb to go by. These old photos we had to scan and the detail isn't as nice as I'd like (you can click the images to enlarge), but you can see the detail on the legs that the Sheraton style furniture has compared to the Hepplewhite. 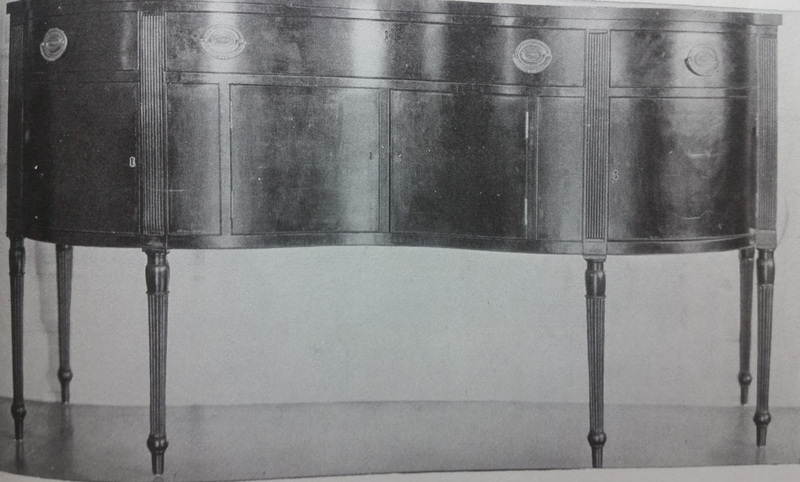 Both are tapered, but Sheraton style furniture features turned legs with a lot of detail. Many time the legs have "knees" for a little extra flash. Again, I want to be clear, this is not the only difference between the styles, far from it. This is just the easiest way to quickly and pretty accurately figure out if you are looking at a Hepplewhite piece or a Sheraton piece. 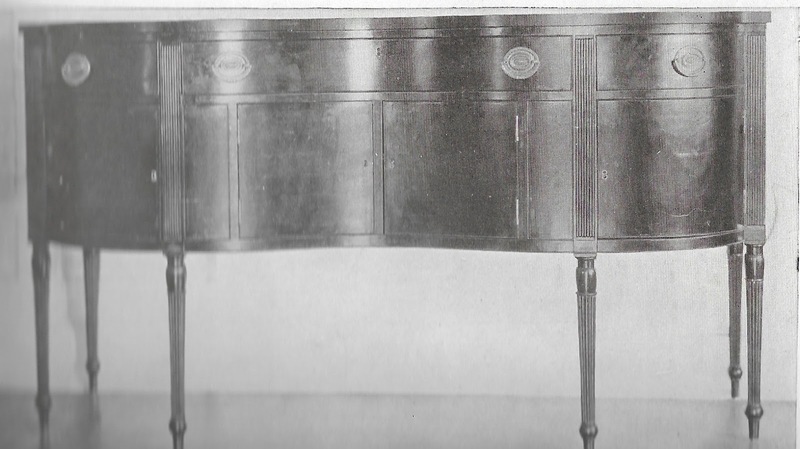 As I mentioned before, this little trick works all pretty much all types of furniture these two created and below is a good example of a Sheraton (on the left) style curio/writing desk next to a Hepplewhite (on the right) style curio/roll top writing desk. You can spot several style differences between the two but what jumps right out? The legs! 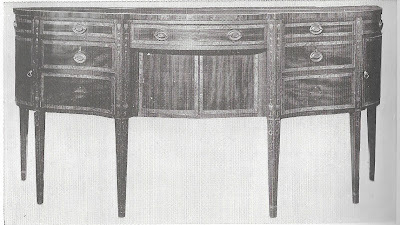 The Sheraton on the left features turned and styled legs while the Hepplewhite piece sticks to the squared off legs. 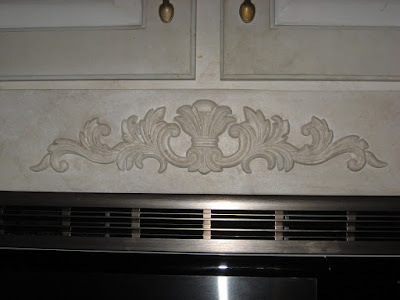 We have some tremendous do it yourself type people at a number of different blogs that have made great use of our wood carvings and trim appliques. Stained, painted, or glazed to give each one a unique look, they makeover everything from dressers to shelves and a few things in between. Let's have a look at all the different ways you can make our products go from good to outstanding! 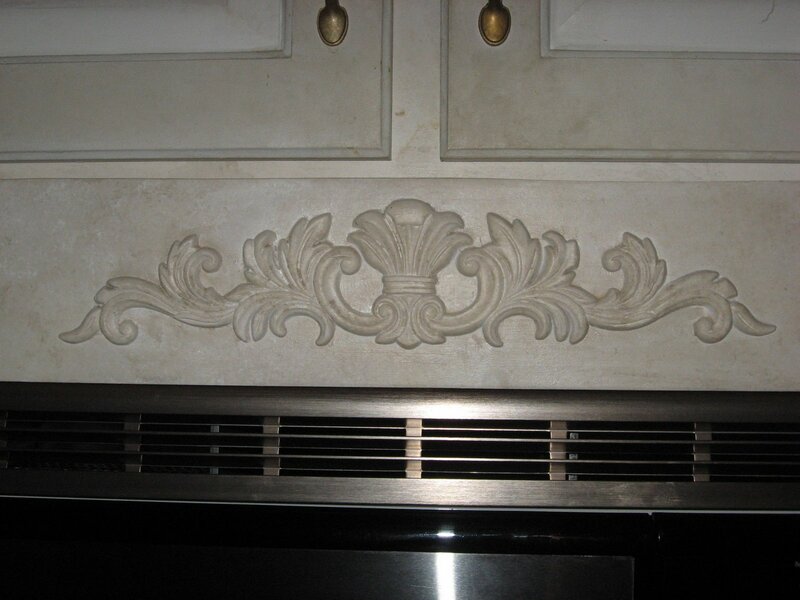 The "icing on the cake" provided by our 12" scrolls makes this cabinet makeover look fantastic. Curb Alert takes a $20 broken record player/stereo cabinet and fixes it up beautifully. Slightly Coastal used our scrolls too along with a center piece and some corner pieces for her French country wooden valance. 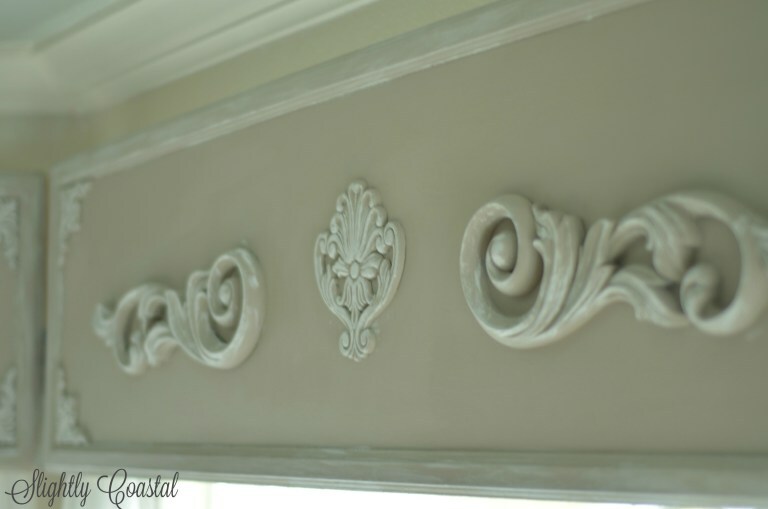 The valances were built using 1/4" birch plywood and inexpensive trim. Check out the full result over at her website. Making use of our appliques and wood carvings, this features swag flowers, buds, & leaves. From a dark stain to this new light grey color this is now a fine TV armorie from Uniquely Grace. The color you see here is actually two parts Linen and one part Mustard Seed Yellow. Using our knobs and flowers on curved stem applique, Noble Vintage makes this dresser makeover come together quite nicely. 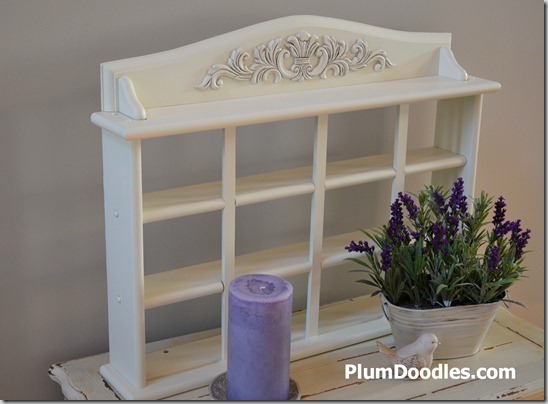 Plum doodles did a number on this country curio shelf update. The before and after is striking. She used some milk paint with a bit of gray primer because of the way it gives a shadowy look to the white milk paint. And a bit of glaze around the wood applique to highlight the details. Get the full scoop at her blog. This is just one of the appliques used in Christys Thrift Decorating article about how to decorate with wood appliques. With over one million page views, don't miss out on the advice this blog has to offer. 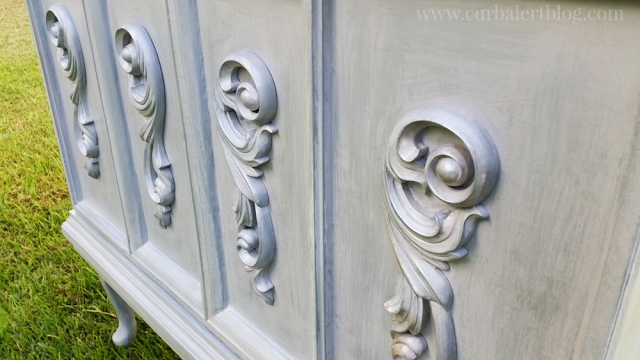 From plain Jane to classy antique dresser makeover, our corner wood appliques help provide that classy antique look. 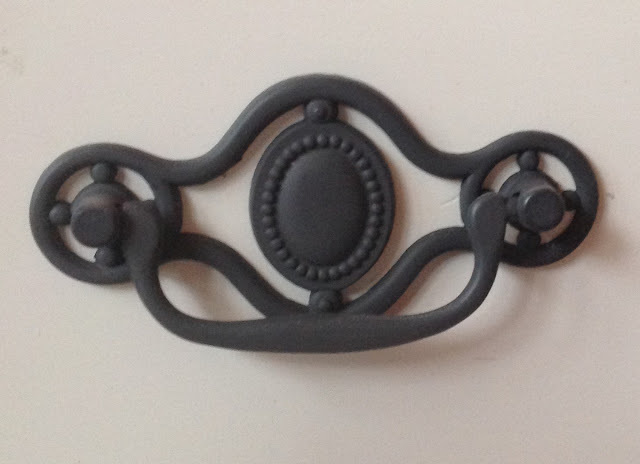 With some center piece appliques and our satin pewter cup pulls this piece is complete. From Redo It Yourself Inspirations, see how this piece gets all jazzed up. 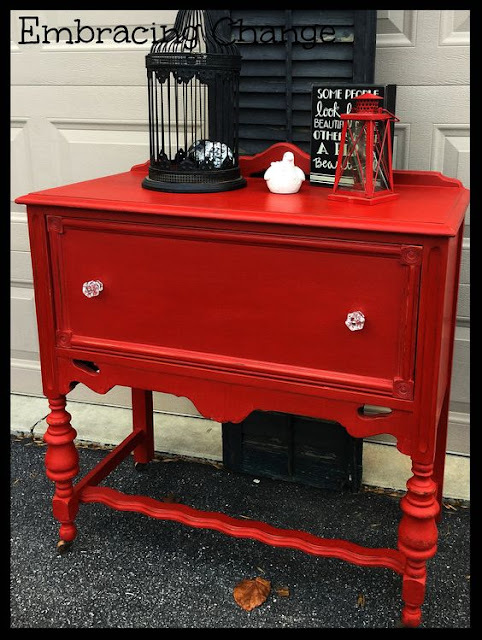 Holiday Giveaway at The Painted Drawer! We are happy to announce that we are a small part of a holiday giveaway at The Painted Drawer! The contest runs until the 13th! We provided a $50 gift card so that you can top off your makeover with some hardware, but the main prizes are from DecoArt. Lots of paints and brushes to the winner! 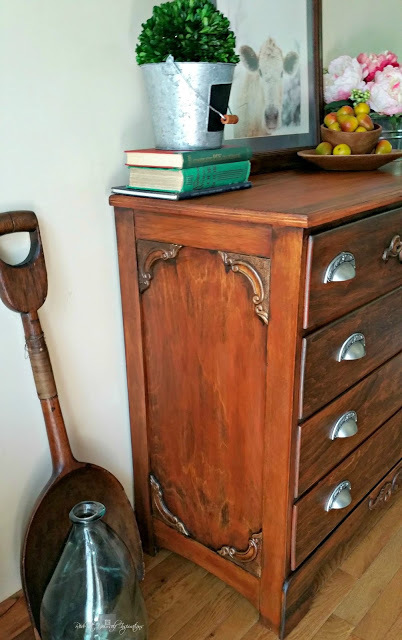 Suzanne has used our hardware on a number of beautiful projects over the years so I'll just share a few below and link over to the posts they appeared in. Starting with my favorite! This pair of matching French Henredon tables feature some pulls from our antique restoration hardware section and has incredible detail in the paint job! Next up is an empire style dresser with a nice red paint job that features our octagon cut glass knobs! And finally a nice little side dresser end table in a distressed blue paint job and using our cut glass knobs again. Don't forget to enter today for a chance to win! 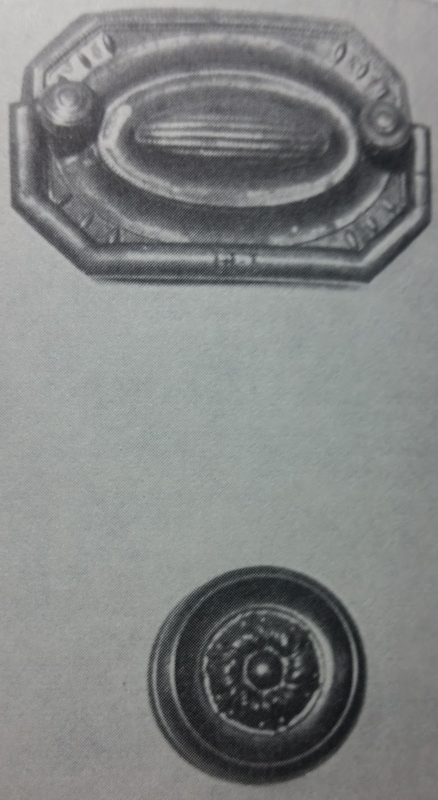 I recently had the pleasure of coming across some old photos of Sheraton style hardware that were taken nearly 100 years ago. Since the Sheraton style came to prominence so long ago in the late 1700's I found it very interesting to see if what is available out there today really looks like how it used to. We actually don't carry much of this style hardware, we've got this Sheraton bail pull here, but here is a google image search of it so you can compare for yourself. Seems to me everyone is doing a pretty good job reproducing the original style. So here's a look at a few pieces and their applications from way back. Circa 1810 these next two pictures show off some of the detail available at the time. 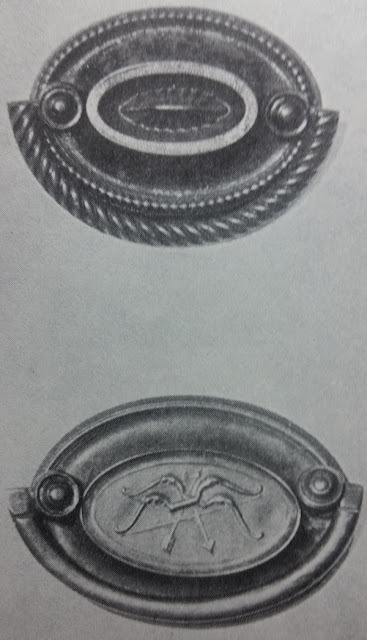 The first pull features an ear of corn while the knob boasts a decorative wreath in the middle. The two bail pulls below would have been made of brass and each one has it's own design. Not sure what the top one is but the bottom shows two bows and two arrows crossing each other. And here are few Sheraton school desks with the original hardware. Tough to see from the old photography but still very interesting to me and hopefully some others, haha! 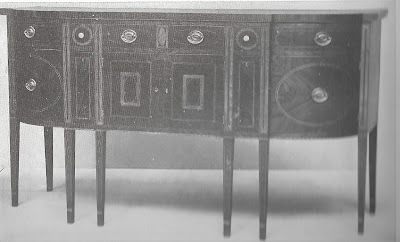 This first one is from around 1790. 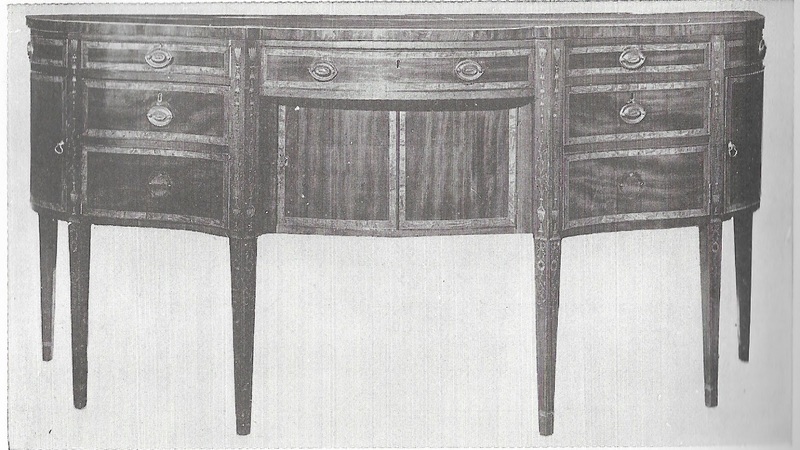 This sideboard is made from Mahogany and shows off the usual distinction between a Hepplewhite and Sheraton sideboard. Sheratons have turned legs while Hepplewhites have squared tapered legs. Another one from around 1800. 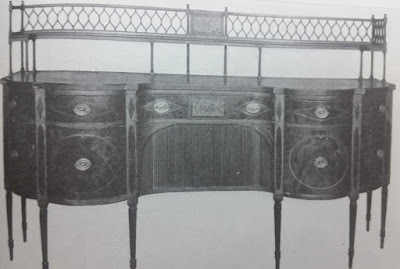 This one has a nice shelf built into the top which would have been quite the upgrade in this time. Nice bail pulls to top it off. 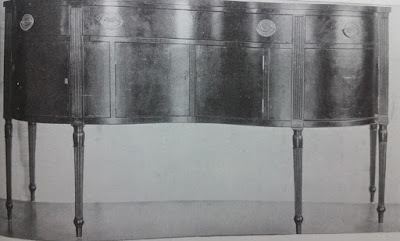 Another from around 1800 is this serpentine front sideboard with Sheraton style knobs. I'm gonna make a bunch of these posts because I enjoy learning about the styles so much myself, so I hope everyone else is interested too! A chair and a stool are two different distinct types of furniture. The stool came first. One of the earlier forms of seat furniture. A stool consists of a single seat, without back or armrests, on a base of either three or four legs. A chair is any piece of furniture with a raised surface that can be used to individually sit on. A chair without a backrest and armrest is considered a stool. In the early times, stools were quite general and chairs were rare. Chairs were reserved for the gilded classes. Kings, noblemen, and statesmen used them to conduct their business or hold court. While your average pleb was relegated to sitting on stools, chests, or even the ground. 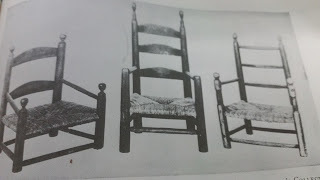 Also, chairs in early times, were always ornate and exquisite, made from expensive material like ivory, bronze and acacia wood. Decorated with beautiful carvings and designs, they were handcrafted works of art. In the 17th century, except in high society, there was often only one chair, that for head of the household. As the 18th century wore on, this condition was reversed. The progress of the position of women can almost be measured by this change. 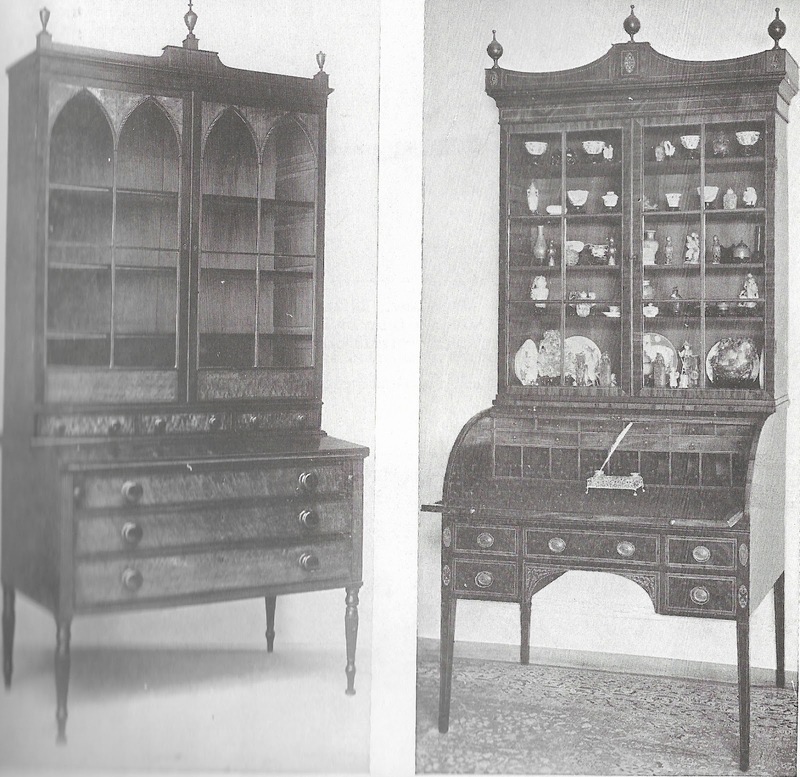 The Queen Anne, featured below, is quite rare partly for this reason. Foot stools of an ordinary character have always, of course, been in use. 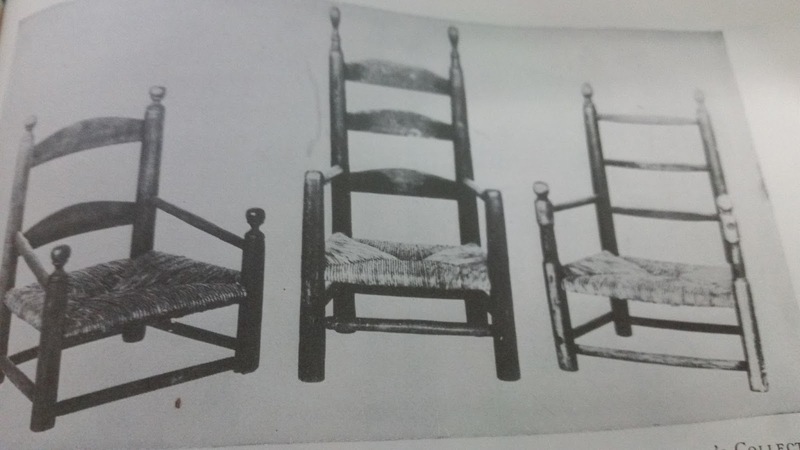 To leave you with a dubious fact, according to the Furniture Treasury, most chairs have over time been cut down or destroyed because every third generation a short person occurs. Last Free Hardware Friday of the Year! THIS PROMOTION HAS ENDED. PLEASE CHECK BACK THE FIRST FRIDAY OF THE NEW YEAR! WE'LL HAVE SOMETHING REALLY GOOD! This will be the last Free Hardware Friday of the year as we always have a ton of stuff to do at the end of the year. Each year we close on the 23rd of December and remain closed until the new year. This means we've got a lot to do for our customers and business partners to get them and ourselves all set for the new year. So if you've got supplies you'll need in late December, get your order in now! For today though we've got this piece from Liberty Hardware. It's a little tiny guy with dimensions of 1" x 1". It has centers at 5/8" to keep it from rotating when installed. Rules are below! Promise me (Derrick Lawless) in writing at the e-mail lawlesshardware (at) gmail (dot) com that you will take photos of your project in a timely manner (I am quite lenient and have no enforcement mechanism, lol) and send them to me. Describe your project and tell me how many knobs you need. Give me your address and I send them right over. See you next week and thanks to all that participate!